This oceanfront condo is located in the Playa Fortuna condominium just a short distance south of Luquillo Beach. This 3rd floor, 2 bedroom, 2 bath, apartment is tastefully decorated and furnished throughout. 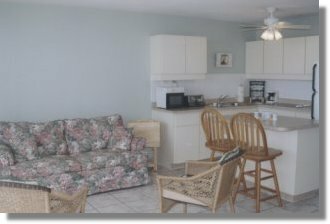 Amenities include a fully equipped kitchen, a very comfortable covered ocean-facing balcony for sitting and enjoying the ocean views. There is also a lovely view of El Yunque from the master bedroom. This apartment is located just minutes from Luquillo Beach, El Yunque, and the Riomar Golf Club and Casino. A 2 bedroom, 2 bath apartment with fully equipped kitchen, air conditioning in bedrooms, ceiling fan in kitchen, microwave, stereo, all bed linens, phone, 600 gallon cistern, two secure off-street parking spaces, a large balcony with ocean views. Located in the quiet, gated and secured Playa Fortuna condominium of Luquillo Puerto Rico. 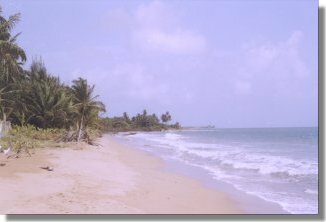 Rates: $925.00 Weekly- Lo Season / $1025.00 Weekly- Hi Season "1 wk Minimum"
This Puerto Rico vacation rental apartment is located on the beautiful Playa Fortuna Beach located east of San Juan. This is a red-golden sandy beach suitable for swimming, snorkeling, and water sports. This is a popular surfing spot in the winter months. Or just sit back and relax in you own covered balcony, and enjoy the surf and the beautiful views each day. This home offers all the amenites you expect in a relaxing vacation.